Julianne MacLean is a USA Today bestselling author who has sold more than 1.3 million books in North America alone. Her novels have also been translated into Spanish, German, Portuguese, French, Japanese, Italian, Turkish, Russian, and Dutch. She has written twenty historical romance novels, including the bestselling Highlander Trilogy with MacMillan/St. Martin’s Press and her popular Pembroke Palace Series with Avon/Harper Collins. The first novel in her contemporary fiction series, THE COLOR OF HEAVEN, was a USA Today bestseller in 2013. Julianne is a four-time RITA finalist with Romance Writers of America and has won numerous awards, including the Booksellers’ Best Award, the Book Buyers Best Award, and a Reviewers’ Choice Award from Romantic Times for Best Regency Historical of 2005. She has a degree in English Literature from the University of King’s College and a degree in Business Administration from Acadia University. She lives in Nova Scotia with her husband and daughter, and is a dedicated member of Romance Writers of Atlantic Canada. She is represented by Creative Media Agency in New York. Will you write any more historical romances? First of all, I want to thank all of you who have written to me about this. Your letters mean so much to me. The last book in the Pembroke Palace series for Lady Charlotte (SEDUCED AT SUNSET) came out in 2013 and that finishes up the Sinclair siblings. I have received some letters suggesting that I continue with the next generation of Sinclairs, which would bring me to the turn of the century/Edwardian period. I do have plans to write another book in my American Heiress series - possibly a prequel - and I'm hoping to get to that in 2018. I love receiving your letters! They truly help me decide what to do next. Do you ever have to change or rewrite your books? I am always rewriting. Every day I polish what I wrote the day before, and I have a critique partner who reads my full manuscript and offers suggestions before I send it to my editor. Once my editor receives it, she suggests more ways to improve it, and I do another revision. Then it goes for another round of edits and I see it again to make more changes. Lastly, I approve the final version just before it goes out into the world, and even then, my beta readers still find some typos. With self-publishing, I can always go in and fix/change something at any time and I love being able to do that. Yes. I am represented by Paige Wheeler at Folio Literary Management and we've been together since 1998. She took me on as a client when I was unpublished, though I had been submitting my work to publishers on my own. At that time, I had already sent my book to Harlequin Historicals. When she agreed to represent me, she called Harlequin and asked them to pull it out of the slush pile. The rest is history. Do you plot in advance or write by the seat of your pants? A little of both. Mostly, I have the main plot points outlined, but everything in between depends on how the characters are feeling and reacting on a scene-by-scene basis. Each day is usually a surprise. When I sit down I have a general idea of what's supposed to happen, but the details and the all-important dialogue are mysteries until I start writing. That can sometimes take the story in new directions, and I like to just go with it, while still holding on to the overall direction for the ending. I'm the daughter of a jazz musician, so I will always love jazz classics. Play "Take Five" for me, and I'm a happy camper. I'm also nostalgic about the 80's, so I have a soft spot for REM, U2, Billy Joel and Bob Seger. A few of my all time favorite songs are "Into the Mystic" by Van Morrison and "The Girl From Ipanema," which always makes me smile. I love Lou Rawls's live version of that one. Other notable faves: "Pure Imagination" from Willy Wonka and the Chocolate Factory. The cast of Glee did a wonderful version of it more recently. And "What's Up" by 4 Non Blondes is another all time fave. In the classics, I love The Bucanneers and The Age of Innocence by Edith Wharton, Washington Square by Henry James, Rebecca by Daphnie DuMaurier, Jane Eyre by Charlotte Bronte, Wuthering Heights by Ann Bronte. And I can't forget my nostalgic favorite, Forever, by Judy Blume. Recent favorites are The Thirteenth Tale, The Girls by Lori Lansens, Pope Joan by Donna Woolfolk Cross, and Crow Lake by Mary Lawson. I often read the monster bestsellers, to see what all the fuss is about. I recently discovered Jane Green, who I really like. How many books do you anticipate having in the Color of Heaven series? As of summer 2017, there are 13 books available in the series. I do plan to write more, and I don’t want to put a limit on it. It might be 14, it might even be 30, depending on how readers respond to more books. What’s nice about this series for me as a writer is that every book is different. I’m not constrained to one family or one town. I can move around and write about new characters all the time - as the series thread is more about the theme (of real life magic), rather than a specific set of characters or a particular location or overall plot device that needs to be resolved. How long did it take you to sell your first book? Do you recommend self-publishing? It took me six years to sell my first book to Harlequin (I sold in 1999). Before that, I wrote four manuscripts that never sold, but I spent that time learning the craft and the business of writing. I joined Romance Writers of America, I attended romance writing conferences, belonged to critique groups, entered contests and submitted my work everywhere. I received many rejections but never gave up. Persistence was key. Today an author has the choice of self-publishing instead of waiting for a publisher to offer a contract. My concern with this is that some authors may not have developed their voice and craft to a high enough level before they leap into self-publishing. It's important to take time to make sure your book is GOOD before you publish. I advise authors to get feedback when they're first starting out and don't rush it. When it comes to the business side of self-publishing vs. traditional publishing, I think self-publishing makes more sense in terms of royalties, speed of publishing, and a gazillion other reasons, but I also understand how some authors can't let go of the dream of selling to a NY publisher. A lot of authors these days are finding success with self-publishing first and then selling to NY. I think that may be a wiser approach, because at least you are in control of your destiny. At the same time, traditional publishers can offer certain things that an indie author can't achieve on her own--like print distribution to bookstores or a different level of marketing support. But an author needs to be careful because sometimes the marketing they provide is no better than what we can do ourselves. It depends on the publisher and the terms of the deal. Yes, a ton, and I love it. It's a nice break from filling a blank page. When my creative well is empty, research fills it up. 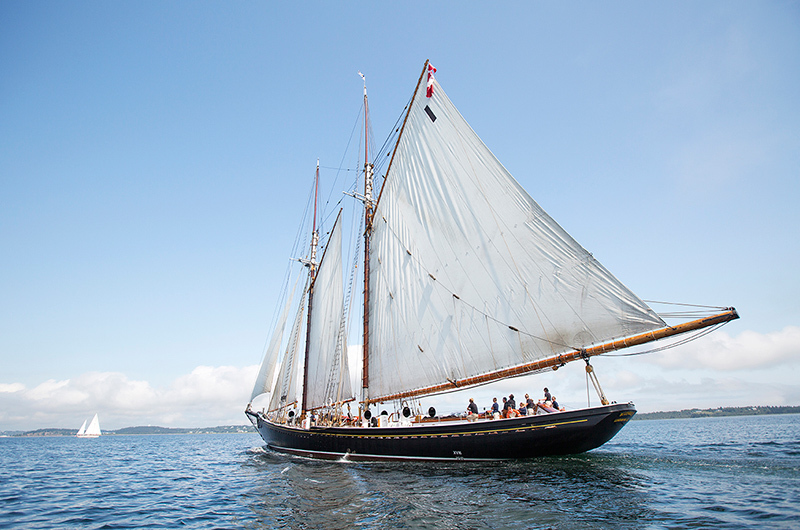 I once went sailing aboard this schooner - the Bluenose II - with Prince Edward when he visited Canada. 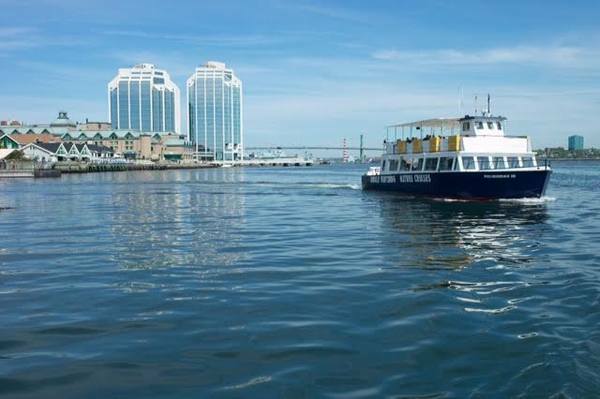 The interesting thing is, my agent, Paige Wheeler, was visiting Halifax at the same time and also met him, and was there when the boat sailed off, so we likely crossed paths on the wharf. This was almost 20 years ago, and we only discovered this after working together for seven years. It sure is a small, freaky world. 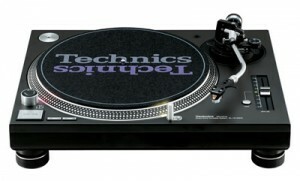 I was a DJ in a dance club during my university days. I worked every Saturday night playing 80's dance tunes like Push It and Bizarre Love Triangle. I even won third place in a beat mixing competition. I was the only girl spinning records in the Halifax clubs at the time. One of my summer jobs during college: I was a tour guide on the Haligonian II - a historic boat cruise around Halifax Harbour. "Over on your left, we have the site of the Halifax Explosion, which occurred on December 6, 1917..." Summer jobs don't get much better than that.